One of the "big names" in German poetry, and a native of Quedlinburg, Klopstock is probably best known for his introduction of human feeling into the rather dry and formal style that preceded him. He also broke with the rigid structure of German verse and used a free-form, unrhymed meter. His masterwork was an epic poem about the life of Jesus, called The Messiah, which resulted in the comparison with Milton's Paradise Lost. Parts of this poem were included in Mahler's Resurrection Symphony. Klopstock also wrote many odes and short poems which dealt with themes of love, death, friendship and appreciation of the higher emotions and thoughts. she did not feel it and slumbered on. I truly felt it, and knew it not. then she woke from slumber. and around us rose Elysium. 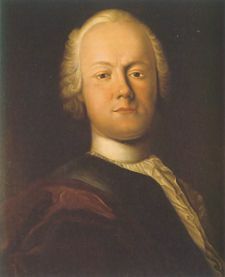 Klopstock suffered for years from unrequited love for an unattainable cousin and his first wife died in childbirth after only four years of marriage. In spite of his personal sorrows, he was described by his contemporaries as unfailingly vivacious, cheerful and kind. When he died at the age of 80, his funeral was attended by princes and hundreds of friends and admirers. sie fuehlt es nicht und schlummerte. ich fuehlt es wohl und wusst es nicht. und um uns wards Elysium.